After the death of an English monarch in the 14th and 15th centuries there was general chaos surrounding the throne. Different factions believed their person should indeed be King of England. This was really highlighted after Richard II handed over his crown to his cousin, Henry Bolingbroke, aka Henry IV. The Wars of the Roses then helped to decimate the remaining pool of contestants to only a few. 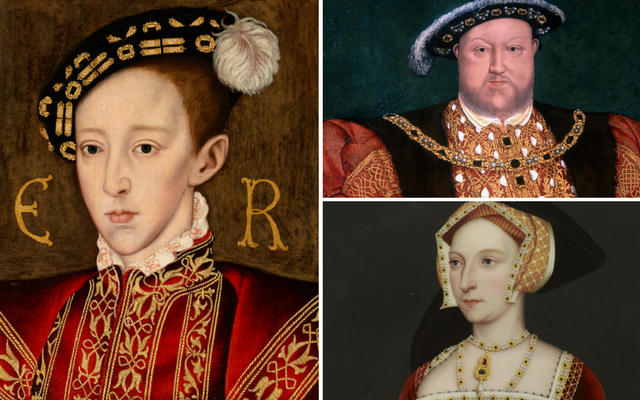 An act of succession was always an important to a ruling monarch and Henry VIII was no exception. Today we look at his acts of succession and his revision to his will on 30 December 1546. In July 1543, Parliament enacted the Third Act of Succession (1544) which overrode both the first and second act of succession. What were those you say? The First Act of Succession was to ensure that the children of Henry and Anne Boleyn inherited the throne after his death and the Second Act of Succession favored the children of Henry and Jane Seymour. 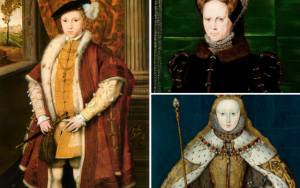 The Third Act of Succession which had gained royal assent when Parliament closed in February 1544 determined a new line of succession. This one led with Edward, then Edward’s children. 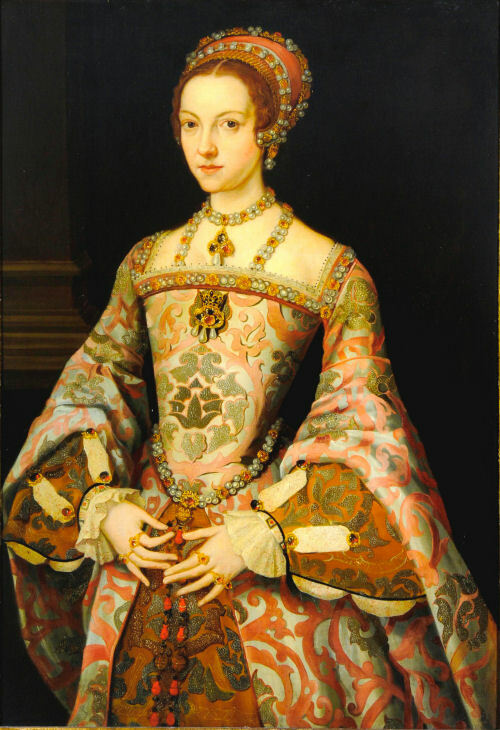 After Edward any son Henry VIII might have with Katherine Parr, and then that son’s children. 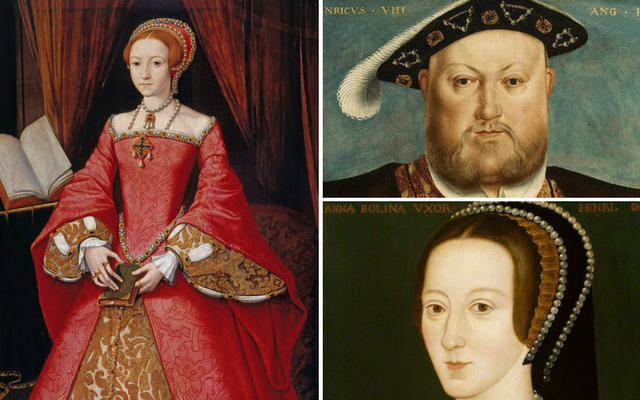 It didn’t stop there – if Henry VIII married again after Katherine Parr any future wives children by him…of course sons. It wasn’t until then that Mary, any of her children and then Elizabeth and any of her children were included. It would seem a long way before Mary and Elizabeth would get a chance to rule. 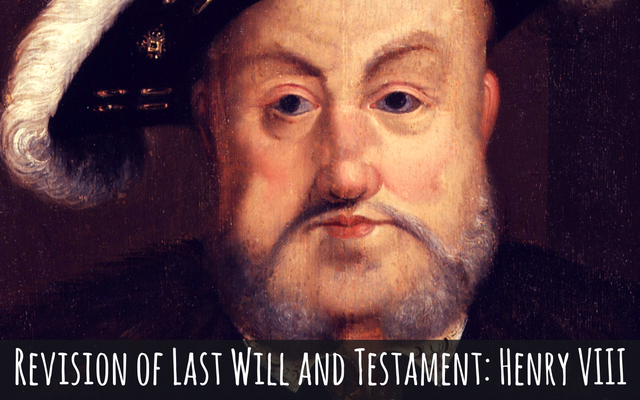 On the 30th of December 1546, an ill Henry VIII signed a revised last will and testament. Historian Eric Ives stated the changes were made to ensure a successful transfer of royal authority to his son and heir, Prince Edward. There has also been speculation that after this version was signed, and after Henry’s death, the will was changed. The 30 December 1546 date for the finalizing of Henry VIll’s will is vindicated and the text re-established as the king’s own work, namely (1) the supposed priority of a copy dated 13 December is shown to be erroneous; (2) the hypothesis that the will was manipulated by faction is rejected because (a) a reconstruction of the operating procedure of the Dry Stamp Office indicates the strong probability of the traditional date, (b) analysis of provisions allegedly suggesting forgery reveals no valid grounds for suspicion, and (c) circumstantial evidence; (3) the real interest of the Seymour faction in January 1547 is demonstrated as lying in implementing the king’s intentions. An hypothesis is offered as to the king’s motives. The prominence given to reformers is explained as projecting forward a movement from orthodoxy to reform which was inherent in the Supremacy. The conciliar provisions for Edward’s reign are argued to be an attempt to create a closed regency council which would prevent both faction and individual bids for supremacy. The fact that Edward Seymour could become de facto regent only by a coup which jettisoned the will, is a vindication of Henry’s provisions. Ives, E.W. (1992) ‘Henry VIII’s will – a forensic conundrum’, The Historical Journal, 35(4), pp. 779–804. Professor Ives has demonstrated the weakness of some of the grounds for thinking that Henry VIII’s will was tampered with after 30 December 1546. But he has not mentioned Paget’s later testimony suggesting that the ‘unfulfilled gifts clause’ was inserted in the will after 12 January 1547. Even if it was part of the will by 30 December, the gifts implemented by its authority resulted from later skilful and ruthless manipulation of the king. Henry’s ‘unwritten will’ greatly strengthened Edward Seymour and his allies and gave William Paget, who was largely responsible for its final shape, the means of buying off potential objectors to Seymour’s elevation to the protectorship. Houlbrooke, R.A. (1994) ‘Henry VIII’s wills: a comment’, The Historical Journal, 37(4), pp. 891–899. doi: 10.1017/S0018246X00015144. Remembering the great benefits given him by Almighty God, and trusting that every Christian who dies in steadfast faith and endeavours, if he have leisure, to do such good deeds and charitable works as Scripture commands, is ordained, by Christ’s Passion, to eternal life, Henry VIII. makes such a Will as he trusts shall be acceptable to God, Christ, and the whole company of Heaven, and satisfactory to all godly brethren in Earth. Repenting his old life, and resolved never to return to the like, he humbly bequeaths his soul to God, who in the person of His son redeemed it and for our better remembrance thereof “left here with us in his Church Militant the consecration and administration of his precious Body and Blood”; and he desires the Blessed Virgin and holy company of Heaven to pray for and with him, while he lives and in the time of his passing hence, that he may after this “the sooner attain everlasting life.” For himself he would be content that his body should be buried in any place accustomed for Christian folks, but, for the reputation of the dignity to which he has been called, he directs that it shall be laid in the choir of his college of Windesour, midway between the stalls and the high altar, in a tomb now almost finished in which he will also have the bones of his wife, Queen Jane. And there an altar shall be furnished for the saying of daily masses while the world shall endure. The tombs of Henry VI. and Edward IV. are to be embellished. Upon his death, his executors shall, as soon as possible, cause the service for dead folk to be celebrated at the nearest suitable place, convey his body to Windsor to be buried with ceremonies (described), and distribute 1,000 mks. In alms to the poor “(common beggars, as much as may be, avoided)” with injunctions to pray for his soul. St. George’s College in Windsor Castle shall be endowed (if he shall not have already done it) with lands to the yearly value of 600l., and the dean and canons shall, by indenture, undertake:—(1) to find two priests to say mass at the aforesaid altar; (2) to keep yearly four solemn obits at which 10l. shall be distributed in alms; (3) to give thirteen poor men, to be called Poor Knights, each 12d. a day, and yearly a long gown of white cloth &c. (described), one of the thirteen being their governor and having, in addition, 3l. 6s. 8d. yearly; and (4) to cause a sermon to be made every Sunday at Windsor. As to the succession of the Crown, it shall go to Prince Edward and the heirs of his body. In default, to Henry’s children by his present wife, Queen Catharine, or any future wife. In default, to his daughter Mary and the heirs of her body, upon condition that she shall not marry without the written and sealed consent of a majority of the surviving members of the Privy Council appointed by him to his son Prince Edward. In default, to his daughter Elizabeth upon like condition. In default, to the heirs of the body of Lady Frances, eldest daughter of his late sister the French Queen. In default, to those of Lady Elyanore, second daughter of the said French Queen. And in default, to his right heirs. Either Mary or Elizabeth, failing to observe the conditions aforesaid, shall forfeit all right to the succession. Appoints as executors of this will the Abp. of Canterbury, the Lord Wriothesley, Chancellor of England, the Lord St. John, Great Master of our House, the Earl of Hertford, Great Chamberlain of England, the Lord Russell, Lord Privy Seal, the Viscount Lisle, High Admiral of England, the bishop Tunstall of Duresme, Sir Anthony Broun, Master of our Horse. Sir Edward Montagu, chief judge of the “Commyn Place,” Justice Bromley. Sir Edward North, Chancellor of the Augmentations, Sir William Paget, our chief Secretary, Sir Anthony Denny and Sir William Harbard, chief gentlemen of our Privy Chamber, Sir Edward Wootton and Dr. Wootton his brother. All these shall also be Councillors of the Privy Council with Prince Edward; and none of them shall do anything appointed by this Will alone, but only with the written consent of the majority. Sir Edmond Peckham, cofferer of our House, shall be treasurer of all moneys defrayed in performance of this Will. Debts, with redress of injuries (if any such can be proved, although he knows of none) shall be their first care after his burial. All grants and recompenses which he has made or promised but not perfected are to be performed. To his son Edward he gives the succession of his realms of England and Ireland, the title of France and all his dominions, and also all his plate, household stuff, artillery, ordnance, ships, money and jewels, saving such portions as shall satisfy this Will; charging his said son to be ruled as regards marriage and all affairs by the aforesaid Councillors (names repeated) until he has completed his eighteenth year. And the following persons shall be of Council for the assistance of the foresaid Councillors when required, viz., the present earls of Arundel and Essex, Sir Thomas Cheney, treasurer of our Household, Sir John Gage, comptroller of our Household, Sir Anthony Wingfield, our vice-chamberlain, Sir William Petre, one of our two principal secretaries, Sir Richard Riche, Sir John Baker, Sir Ralph Sadleyr, Sir Thomas Seymour, Sir Richard Southwell, and Sir Edmond Peckham. Bequeaths to his daughters’, Mary and Elizabeth’s, marriages to any outward potentate, 10,000l. (fn. n3) each, in money, plate, etc., or more at his said executors’ discretion; and, meanwhile, from the hour of his death, each shall have 3,000l. (fn. n3) to live upon, at the ordering of ministers to be appointed by the foresaid Councillors. The Queen his wife shall have 3,000l. (fn. n3) in plate, jewels and stuff, besides what she shall please to take of what she has already, and further receive in money l,000l. (fn. n3) besides the enjoyment of her jointure. For their kindness and good service his executors shall receive as follows, (fn. n4) viz. :—the Abp. of Canterbury 500 mks., Wriothesley, St. John, Russell, Hertford and Lisle, each 500l., Durham, Broun, Paget, Denny, Herberd, Montague, Bromley, North, Sir Edw. Wootton and Dr. Wootton, each 300l. In token of special love and favour, these Councillors and servants shall receive as follows, (fn. n5) viz. :—The earl of Essex, Sir Thomas Cheney, the Lord Herberd, Sir John Gage, Sir Thomas Seymour, John Gates (fn. n6) and Sir Thomas Darcy, each 200l., Sir Thomas Speke, Sir Philip Hobby, Sir Thomas Paston and Sir Maurice Barkeley, each 200 mks., Sir Ralph Sadleyr 200l., Sir Thomas Carden 200l., Sir Peter Meutes, Edward Bellingham, Thomas Audeley and Edmond Harman, each 200 marks, John Pen 100 marks, Henry Nevel, Symbarbe, ——Cooke, John Osburn and David Vincent, each 100l., James Rufforth, keeper of our house here, —— Cecil, yeoman of our Robes, —— Sternhold, groom of our Robes, each 100 mks., John Rouland, page of our Robes, 50l., the earl of Arundell, Lord Chamberlain, Sir Anthony Wingfeld, Sir Edm. Peckham, Sir Richard Riche, Sir John Bak[er] and Sir Richard Southwell, each 200l., Dr. Owen, Dr. Wendy and Dr. Cromer, each 100l., —— Alsopp, Patrick ——,——A[yliff],—— Ferrys, Henry——, and —— Hollande. each 100 mks., and the four gentlemen ushers of our Chamber, being daily waiters, 200l. His executors may appoint legacies to other of his ordinary servants not here named. Westminster Palace, 30 Dec. 1546, 38 Hen. VIII. Signed with the King‘s stamp (fn. n7) at beginningand end. Signed by witnesses, viz. : John Gates: E. Harman: Wyllyam Sayntbarbe: Henry Nevell: Rychard Coke: David Vincent: Patrec: [Ge]orge Owen: [Tho]mas Wendye: Robert Huycke: W. Clerk. 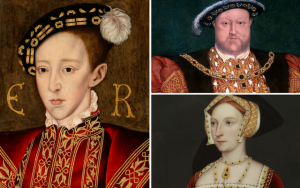 If you love TudorsDynasty.com, my Facebook (Twitter & Instagram) page, podcasts and YouTube channel, please consider making a small donation to help me pay my monthly costs attributed with running the website and podcasts. Any little bit will help and will be appreciated more than you know. The donation link below is through a secure PayPal page (you do not need a PayPal account) and should only take a minute. Thanks in advance!